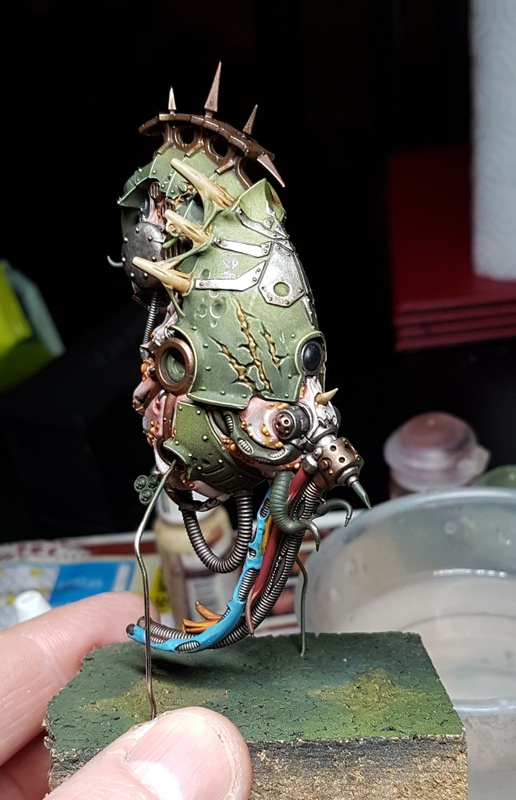 I've been really enjoying painting again and have never owned an airbrush... youtube is doing a good job of convincing me I need one. Any suggestions on a good midgrade starter piece? I don't want to break the bank but I also don't want to buy cheapo stuff I'll need to upgrade right away. I've got a full sized compressor, so I don't know that I'd need an airbrush compressor right away either. I’d say go ahead and just get something cheap like a masters series gravity brush to practice with and get comfortable with usage, cleaning and maintenance before breaking the bank on a good brush. It’ll handle basecoats fine, and by the time you’ve got a handle on what you’re doing and want to move on to more advanced techniques you can get a badger or iwata and be less likely to screw something up in it. I've never used an Iwata Neo but I hear they're cheap, sturdy and decent for priming/basecoating/basic shading. (I use other Iwata branded airbrushes and can attest to their reliability). Dunno what your budget is but you can get them for around £60, and pick up a more expensive model down the line once you're comfortable with it. I'd figured around $100 as I don't need to worry about a compressor.  I don't really plan on getting super fancy, but I'd like to be able to do some basic shading. That's like £70 so it sits right in your price range. Some Hive Guard made out of warrior bodies, cuz I’m not made out of money. Put my goopy concrete basing on them and a Tyrant. Will slather a thick layer of paint on after priming to get it nice and viscous. 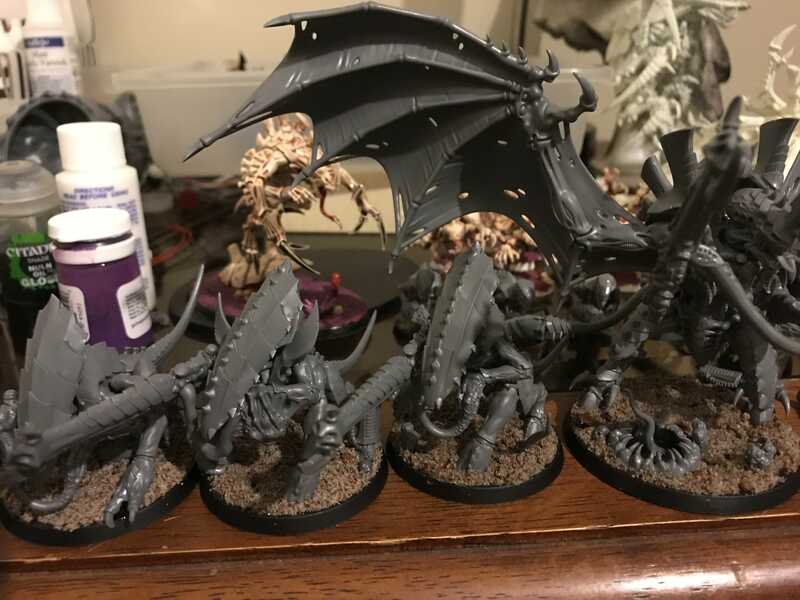 I also did a Tyranids. 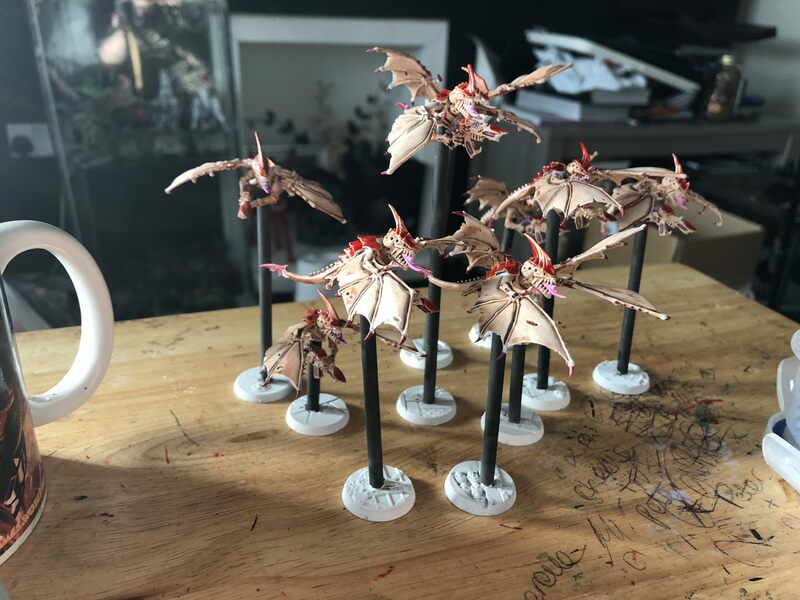 Based up my gargoyles on self made flying bases. Got them in a trade so I didn’t have the original plastics, or had to break off half broken ones. Tried to make it look like they were actually flying in a swarm, instead of all hovering two inches off the table. I think I’m gonna copy that alternate flight stem length thing for my gargoyles. It is literally impossible to put those guys base to base with anything or each other on their normal bases. Are you forging someone's signature in the bottom right? This folding table is so old it dates back to when me and my wife were on high school so it has our names carved into it/scribbled on it. High school table with no dicks drawn on it? You and I are very different people, sir. So I haven't painted anything in probably more than a decade. However I recently started getting a number of board games that come with minis and figured, what the hell. All my paints are dried up and my brushes have disintegrated. I don't remember how to do anything. 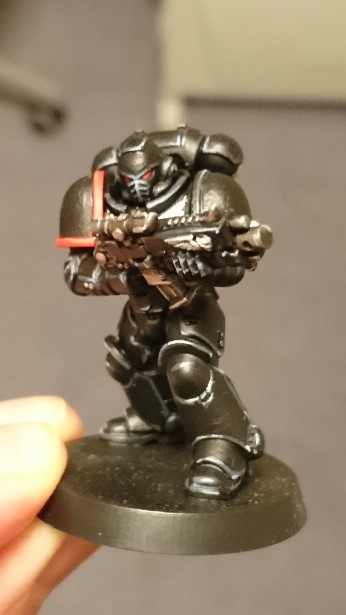 Does anyone have some resources for people (who were never really any good to begin with) returning to the wonderful world of mini painting? What are some decent inexpensive brushes/paints to get? I'm going to start with the 6 starting Gloomhaven minis (and will hold off painting the other classes until they've become unlocked). I think they're mostly standard fantasy fare, so I'll probably need a pretty wide variety of colours I imagine. Got another Forge World share. Right as I'm having another crisis of ability and it makes me feel like a fraud. @Kneel You paint circles around the rest of us. Never doubt your abilities. As someone who currently paints at an Aluminum Demon standard, seeing stuff painted by the people in this thread is very motivating. I used to get really discouraged by all the better painters in this thread and their seemingly effortless creations, but over time I honed it into a sharp loathing that now guides my brush with hatred. Ah, the dark side of painting. Give in to it. Let the hate flow through you like the qiuckshade over your miniatures. Put your diorama away, stick it in a cupboard or something, forget about it for a bit. Paint something else, or play video games or whatever helps you relax. Come back to it with a clear head, you can see with fresh eyes what’s working and what you need to do. The process is tough, and figuring it out isnt easy, but that’s art! Don’t give up, you’re a great inspiration to many (all?) in this thread! That's almost exactly what I've been doing these last two days; I'm doing a bog-standard box art quality Foetid Blight Drone (for eBay) while I clear my head and suss out what I'm doing. I'd check out the Games Workshop painting videos on youtube; they've got some long ones which go through how to paint models from start to finish, as well as some quick tips, which are 2-4 mins long. It's not unusual for me to pick bits and pieces of some of the longer videos, and apply those techniques to other models. They're a really good place to start from; I think you can get some very decent results following their base / wash / highlight or dry brush formula. 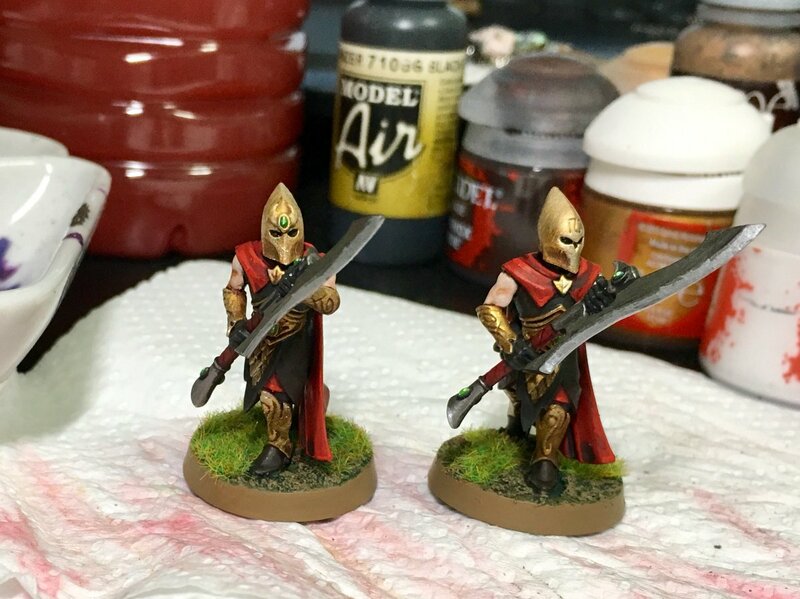 I would agree, I am not near the best or anything, but prime/base/wash/highlight/maybe wash again is a really good way to get started making decent looking, tabletop game ready minis. Just doing what the gw videos and guides show will get you pretty far then you can start to work in more specialized techniques, they took me from stuff that didn't look much better than unpainted to things I was pretty proud to drop on a tabletop. My favorite tip to give people: Make sure your brush is closer to "damp" than "wet". Yeah after getting some extra water in for thinning I'll rinse my brush then let some of the moisture off with the paper towel. Has anyone messed around with this Barbed Bracken terrain kit? Does it take primer like normal plastic, or do I need to do something special with it? 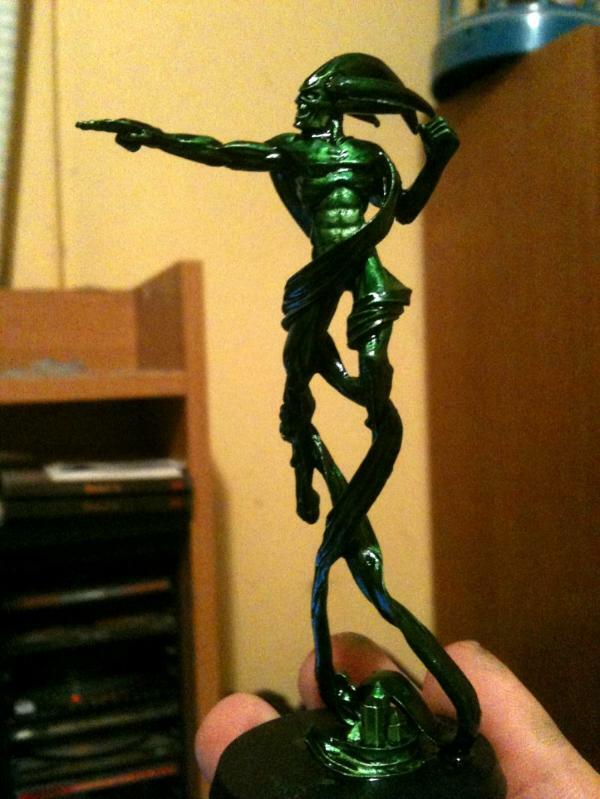 It has very small sprue connectors and is kind of fiddly, so I was just going to prime and paint then clip off and touch up, but I’m kinda leery of it being similar to Reaper Bones plastic and going permanently sticky if I use the wrong paints. From what I keep hearing in video reviews, that stuff is indeed either similar to Reaper Bones or the exact same kind of plastic. I'm not sure what you mean by sticky though. Most spray primers will stay permanently tacky if you use them on the Bones plastic, and additional coats of paint won’t help. If it is the same material I’ll stick to a non-primer paint. Since it’s gonna be on a base, there shouldn’t really be a problem with it getting handled. So I'm still horrible at photographing models but I actually finished painting something for the first time in a while (I say finished, just needs basing and transfers). Will this be the army I actually stick with? Who knows! (Spoiler: probably not). 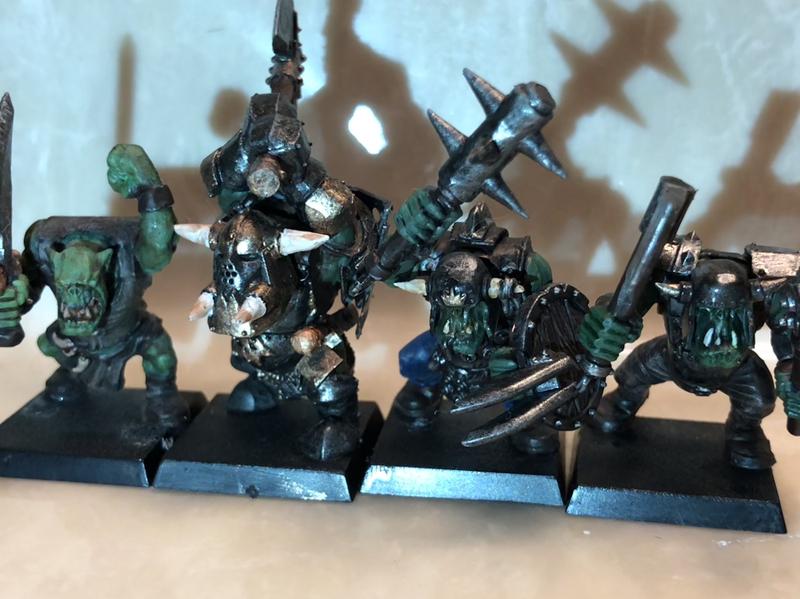 So I have been trying to do some orcs with a more realistic paint job, I feel like they are getting a bit too dark in general. Any tips? Sorry for the terrible picture. Try looking at something like the marine iguana for realistic dark green skin tones. There’s going to be some light green patches, mottling, but mostly dark grey-green skin. I just opened and assembled my multimelta Legion of the Damned trooper. Then promptly dropped him and broke his back banner off. But being resin I was able to fix this one. I even used a little green stuff to bulk out the paperclip I used as a pin. But that sets me back a day on priming. Of course, I also forgot to bring a spare 32 mm base, so I need to wait until tomorrow to glue that on anyway. Priming my first mini in a long time and it's metal. Would you ever consider leaving certain parts like a sword or chainmail bare if it's probably what you'd color it anyway? Speaking from an amateur/bad point of view. Don't leave anything bare, even if it's what you'd normally color it. 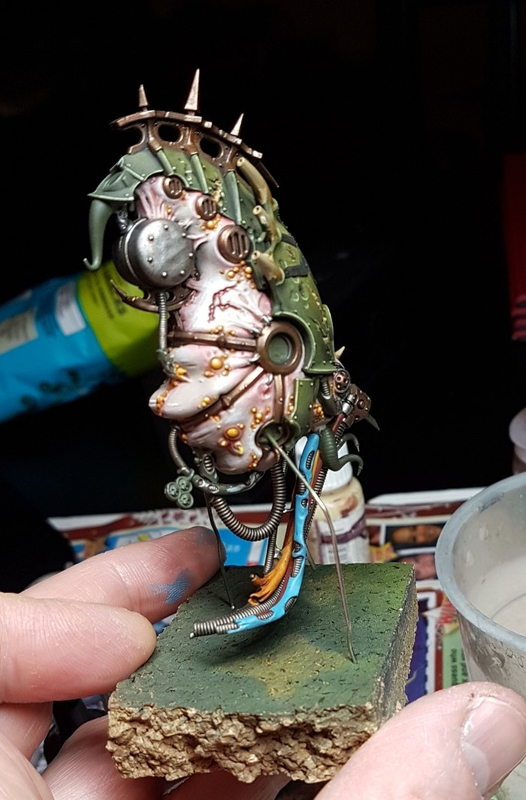 Years ago I painted a metal Necron Nightbringer by doing layers of actual metallic pen inks over the bare metal to try and get that liquid metal necrodermis look they’re supposed to have. It looked pretty good in person with a color changing iridescent sheen, but I had to clean and scrub the metal to a bright mirror polish first, and the first game I played it fell over (being a big top heavy metal model on a 40mm base) and got chipped to hell from just the flock despite several layers of gloss varnish. So yeah, don’t paint bare metal without primer unless it’s a display piece in a cabinet where no one will ever touch it. Nov 23rd 2017: picked up a Typhus box from Warhammer Liverpool. Jan 30th 2018: opened the Typhus box, built his head and then discovered that both sprues in the box were identical. The receipt has vanished in the intervening months. Feb 3rd 2018: returned the box to the store, they go 'hah, typical, no worries' and just grab a replacement sprue off the shelf, no fuss. I know it's not painting-specific but GW/FW's customer service never ceases to amaze/please/surprise me.